Engagement Pictures I have been lucky enough to work with the amazing and talented Chelsea Dawn Photography from weddings to styled shoots, so when she called in March saying that there was an opportunity to work again in April, I thought of course! I also had the pleasure of meeting and working along side a lovely young lady named Natasha from Edmonton working with Chelsea for the week, lucky me! 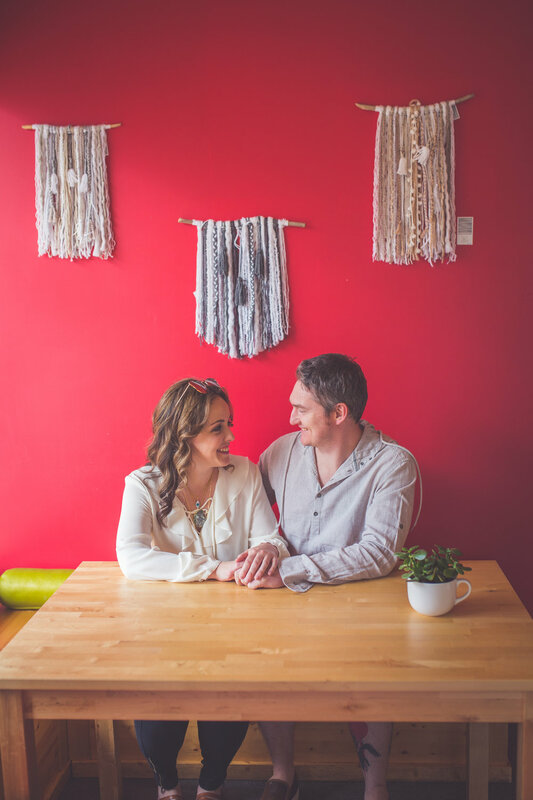 This time we pulled together something different from what we have done in the past, a trend that has been happening for a while now with no sign of stopping - a lifestyle shoot! I had the perfect couple and a little surprise...my lovely friends Hailey and Jason were talking about getting married for a while now and we thought what a great chance to sneak in a proposal! Jason had just come back from Australia (where he is from) the day before the shoot and didn't have much time to pull it off, It was so much fun! We got to do a lot of shopping for some unique decor for the home, plan out all our favourite looks with Finders Keephers and Jim's Clothes closet. We of course chose the amazing Chelsea for makeup and Megan from Hairpin's to pull the look together. We also got to try our hand at florals and cake making! A special Thank you to Shelby from Lilo Decor for lending her home for this sweet April shoot.